Here we will explain the user interface of the Visual Designer. This is the web application you will be dealing with the most when you start with Dragon1. Throughout the help we make consistent use of names for the areas in the user interface. Below you'll see the area names for the Visual Designer. This menu bar let you choose between the various parts of the platform. Click on an item to go to that part. This menu bar let you choose between the various web applications of the platform. Click on an item to go to that part. This menu bar let you choose between the various functions of the Visual Designer. To choose a function, click on a button or do a mouse over on a button and click on an item in the dropdown menu of that button. To create a cabinet, click on the New Cabinet Button in the Button Bar. 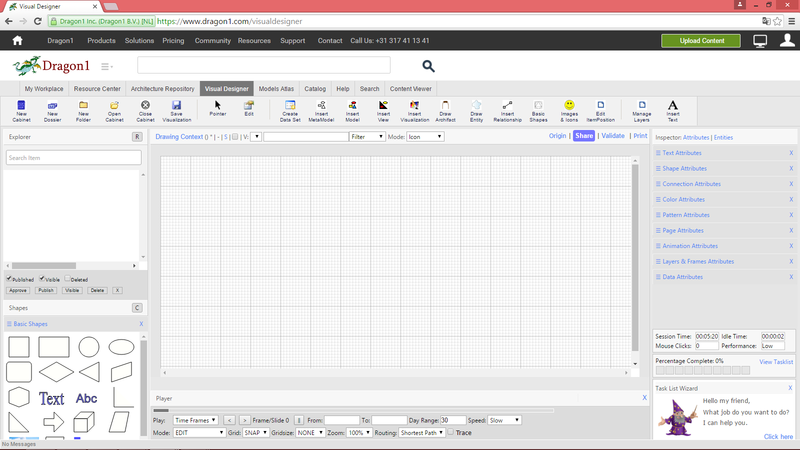 To create a new dossier, click on the New Dossier Button in the Button Bar. To create a folder, click on the New Folder Button in the Button Bar. The Explorer Treeview shows the contents of an opened Cabinet. The Explorer Treeview gives you access to dossiers, folders and items. If you have the access rights to certain items, you will see them. If you do not, you don't see them. An empty folder does not mean that there are no items. The Explorer Treeview is a tri-state control: Normal height, Double height, Zero height. To expand the Explorer Treeview, click once on the word Explorer. To collapse the Explorer Treeview, click twice on the word Explorer. 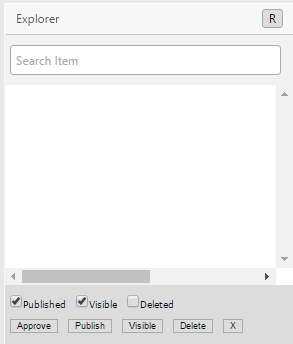 At the bottom of the Explorer Treeview you have the option to hide and delete items. To hide an item, select an item and click on the visible button. To delete an item, select an item click on the delete button. 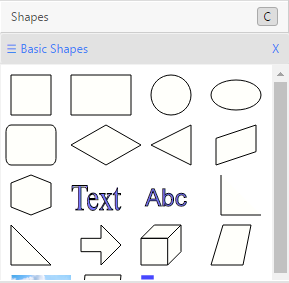 If you have selected a visualization or model, you can drag shapes from the shapes panels onto the Drawing Canvas. Dragging means clicking on a shape. Holding down the mouse button. Moving the shape to the desired position and then let go of the mouse button. Now the shape will be inserted on the model or visualization and the model or visualization will be automatically saved. 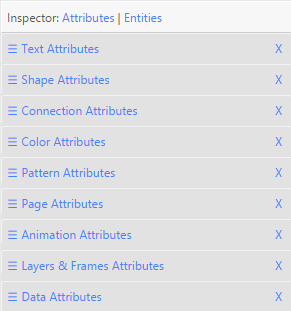 The Inspector Panels are panels with specialized attributes for shapes. There is a text panel, shape panel, color panel, data panel. The Drawing Canvas is a sheet on which you draw shapes. The Player Bar provides you with functionality to play a scenario, go to the next or previous time frame in a visualization. And some other basic functionality. 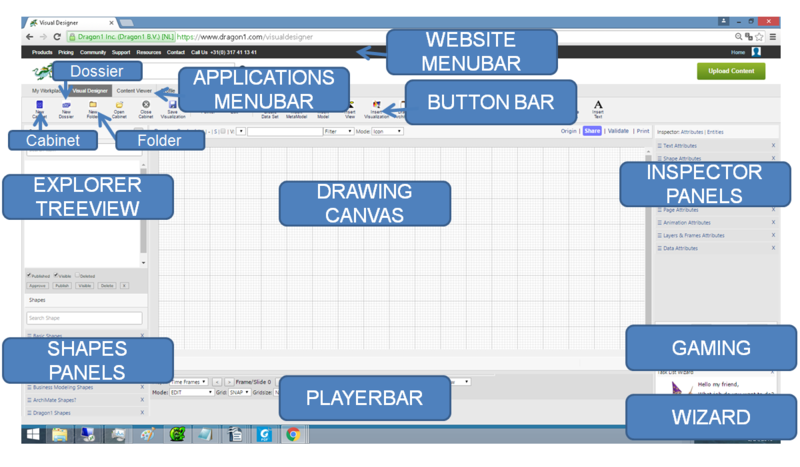 To resize the Canvas to Full Screen in Edit Mode, click on the word Drawing Context in the title bar of the canvas. To resize the Canvas for Presentation Mode, select Presentation Mode in the playerbar. The gaming panel measures how effective and efficient you work: in how much time and in how many clicks do you complete a tutorial? To see how productive you are just look at the figures in the Gaming Panel. The Wizard is a dialog with a set of basic tutorials. You can be guided in creating a basic model, diagram or presentation. To start up the wizard, click on the wizard image.